Come on people, is there anything more suitable than that 50,000 to describe the state of Lebanon lately? If anything, we should look at this positively: it might be the first time ever that those in charge of running things are aware of how dismal they have made things to be, even if only with a representative bill. And they have decided to describe things. Here’s an attempt to explain what went on with their brains. I really don’t know what’s special about the number 70 for it to warrant an honorary bill. Why not 71? Even better, why not 69? I’m positive that number means much more to so many Lebanese than simply 70. Zeros are so overrated if you ask me. Yet again, our currency has so many of them. I guess we have always been a country to celebrate whenever we had the opportunity. Oh, look – can we turn this into a festivity? Sure, why not, let’s do it! One look at that bill and the entirety of our Lebanese existence is summarized in front of you with the monetary version of our infamous “hi, kifak, ca va.” Arabic, French and even a word of English thrown in there by mistake is the perfect summary of how this country is: lost in translation, unaware of what it wants to be or what it is. Let’s stick to our frenchiness would say the people who only know the ca va to every kifak. Except we barely know how to speak French lately as is evident by that hilariously shameful typo on the bill. Side note, is there any other country with a typo on their bills, regardless of what that typo is? No, let’s move on to English man. That is where the future is. Never. We are Arabs. Mutliple personality disorder, perhaps? Who cares, it’s unique. Let’s leave the fact that the new 50,000 will still be big enough for you to use as a picnic mattress. Shouldn’t they resize all our money into something that fits in normal wallets before redesigning the bills at every possible opportunity? Anyway, I’d hate to think our bills can get less efficient than they are. There are just so many zeros there and they’re as useless as they come. That 50,000 bill is so inefficient that it cannot afford you a burger at Roadster’s anymore. Our central bank head decided to blame the British company that printed the bill for the fiasco. Typical, I guess. Let’s always blame others for our mistake, as long as it makes us feel better about ourselves and about the messes we keep finding ourselves in. We get into a war, we blame some mysterious entity. Our economy goes to the trash, we blame some other mysterious entity. Our 50,000 gets a tasteless makeover? Let’s blame the company that printed it, not the Lebanese who must have overseen the design (or lack thereof) process, the Lebanese who did not notice the mistakes and the people with a horrendous taste who OK’ed it. But no worries, ladies and gentlemen, our Joie de Vivre is still well-represented in that bill. Our love of life, love for drinks and parties and getting high is well defined within those mutliple colors that fill that monetary canvas. Pretty nifty, eh? Unless you’ve been living under a rock, you can’t but notice that Lebanon has been on a downward spiral lately. Culture is dying, sometimes at the hands of the ministry of culture. Fundamentalism is rising across the board. The country is losing whatever it has of itself with each passing day. 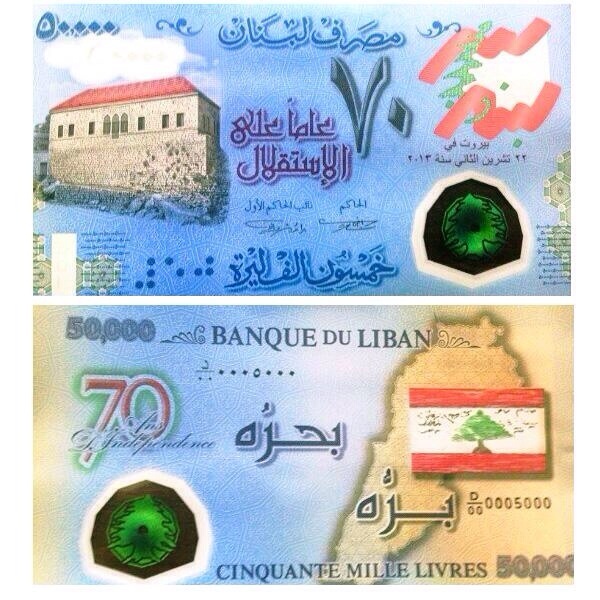 Looking at all of that, our new bill cannot but stand and shout that infamous line: shou we2fet 3laye? Our country is the gift that keeps on giving. Can you imagine living somewhere where life was boring? What would we blog about? When it comes to that 50,000 bill I have to ask: why not use it as our national flag instead?